And just like that it is February my friends. and partly-freaking-out-about finding that perfect Valentine's day gift for your lover. But luckily for you, we've got you covered because today we are sharing with you a fantastic Valentine's day gift idea for your significant other (or best friend - because friends deserve awesome gifts too)! So if you're ready to slay Valentine's Day 2019... Read on friends. 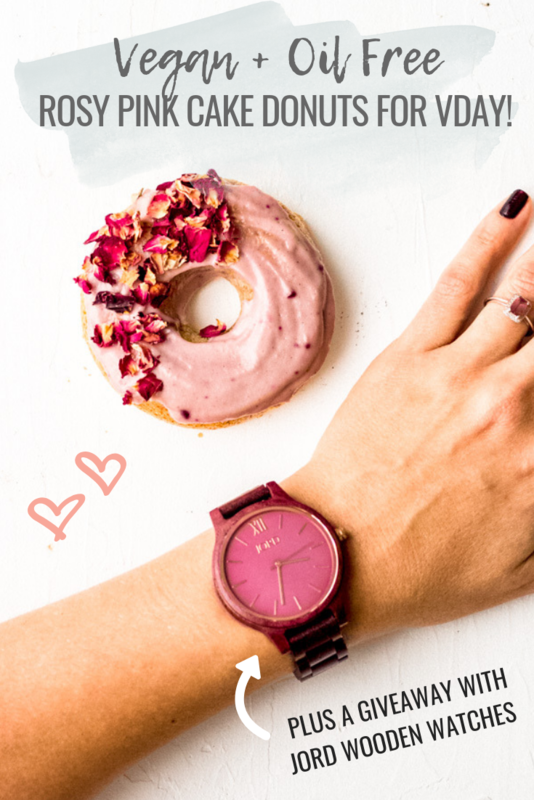 Wooden Watches: The Perfect Sustainable Valentine's Day Gift. Timeless and elegant pieces that are also vegan and sustainable, made with the environment in mind. Music to my ears. 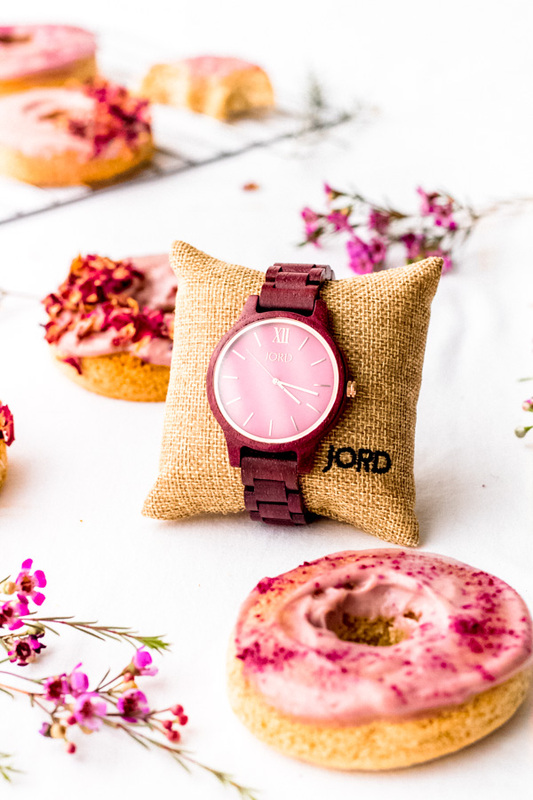 Jord Wood Watches are a modern twist to your traditional watch - with straps made out of wood instead of plastic (which is killing our planet) or leather (which is not vegan), and clasps made with stainless steel which is friendly to those with nickel allergies. I haven't worn a watch in a long time, that is until recently because I am not taking this Jord Wood Watch off, ever, okay maybe to shower. But back to what I was saying... I haven't worn a watch in a long time mostly because the ones I own have either leather or plastic straps - and did you know that plastic can leech toxic chemicals into your system through your skin? ah. So when Jord Watches contacted me about their sustainable Wooden Watches line - I was intrigued. I love it when companies take traditional practices and revolutionize it with brand new methods that are modern and have a positive impact on the environment. Jord Wood Watches are made mostly with wood from fallen trees or furniture remnants - how cool is that? Talk about re-purposing. This company is taking something with little value that would most likely end up in a landfill otherwise, and turning it into these gorgeous pieces of art. Jord Wood Watches do not, I repeat, do not use any toxic or hazardous chemicals on their wood watches. Nope. Not a zilch. Just natural substances - one in particular called Tung Oil. Tung oil is commonly used on wood to give it that nice-sorta-shiny finish look to it. Tung oil is derived from the seeds of Tung Oil Tree, which happens to be toxic, however, the actual oil is not! It is even approved for food contact by the FDA and has a low environmental foot print. I did my research folks. I have one rule when it comes to promoting brands or products on this website, and it's very simple. If I wouldn't use it myself, then I'm not going to promote it to you guys, because what's the point in that? In full disclosure, I did receive my watch for free but all opinions expressed here are my own. 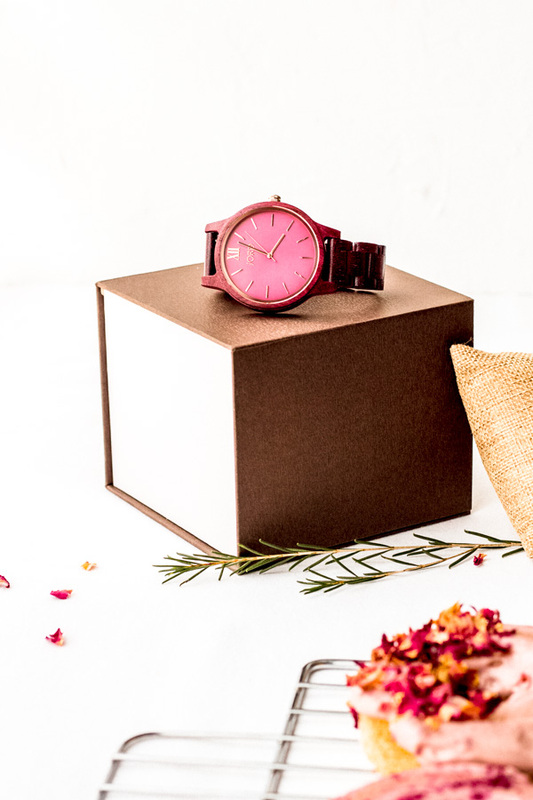 I really really really am in love with these wooden watches and I think that any vegan-earth-loving-sustainable person in your life will totally LOVE them too. so where can I buy a JORD wood watch? 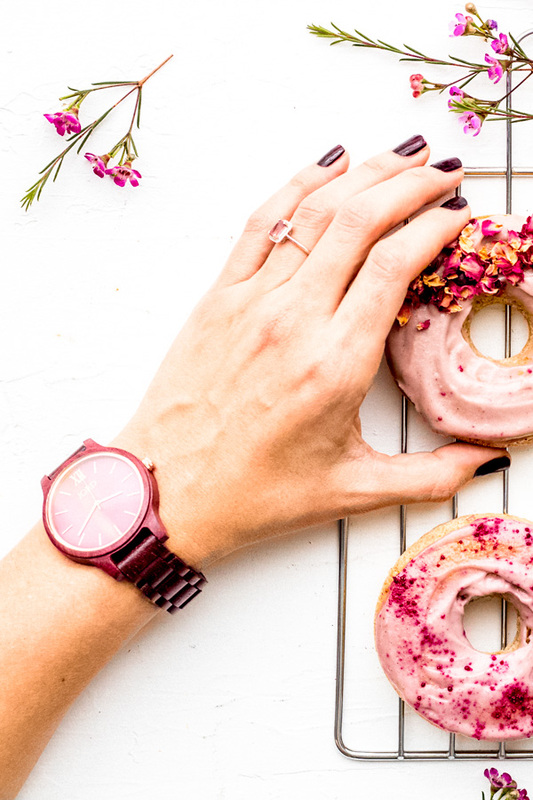 Of course, like the pink-obsessed person that I am, I chose the FRANKIE Purpleheart and Plum watch to match my style AND these rosy pink donuts of course.... Isn't it cute?! But there are a tonnn of styles and colors to choose from... and you can see all these unique watches by clicking this link JORD Wood Watch, that will take you directly to their homepage. 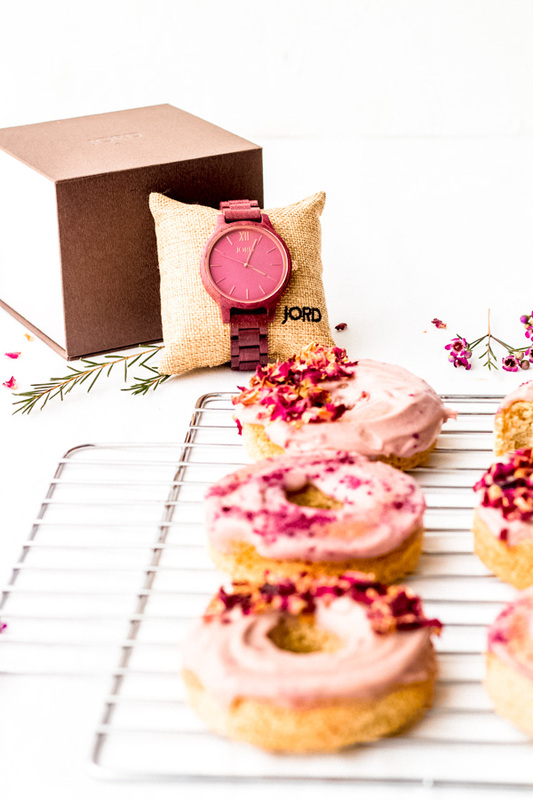 Also in the name of LOVE and GIVING..
We're hosting a GIVEAWAY in partnership with Jord Wooden Watches. YAY! ONE lucky winner will receive a $100 gift card to use at www.woodwatches.com, and even those that don't win will receive a 10% off coupon code! Heck yea! Entering the giveaway is very simple, just click THIS LINK, and you will be redirected to the giveaway page. No purchase necessary to enter. The contest will close 02/24/2019 at 11:59pm CST, and winner will be announced shortly after. $100 gift card and 10% off coupon code will expire on 03/24/2019. *All opinions stated above are my own, and all of the information represented above is only in regards to Jord's Wooden Watches line. 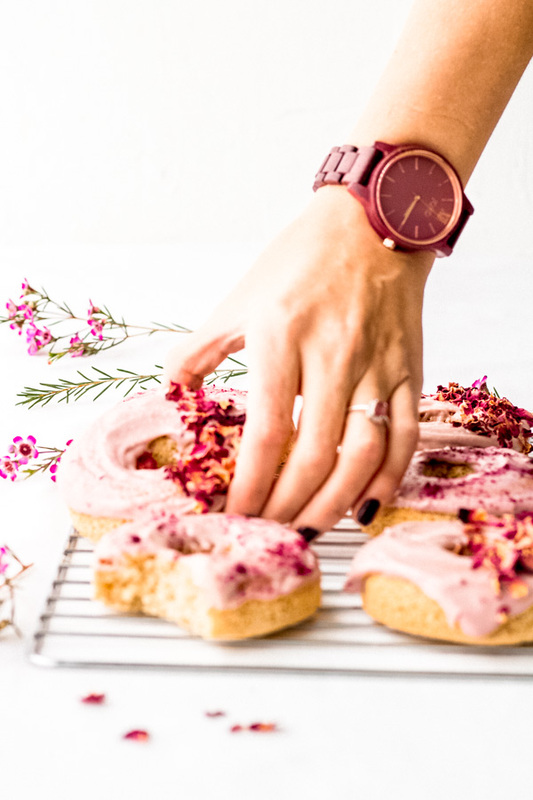 Visit this page if you want the recipe to these rosy pink vegan cake donuts. Want to see more Valentine's Day Vegan Recipes?